It has been a few years now and there are some cuts of meat that have become very popular, maybe due to the influx of cultural diversity, or maybe just plain curiosity. In Edmonton there have been some cutting edge restaurants serving up cuts of meat that normally you do not hear of, restaurants like Three Boars, or Range Road. 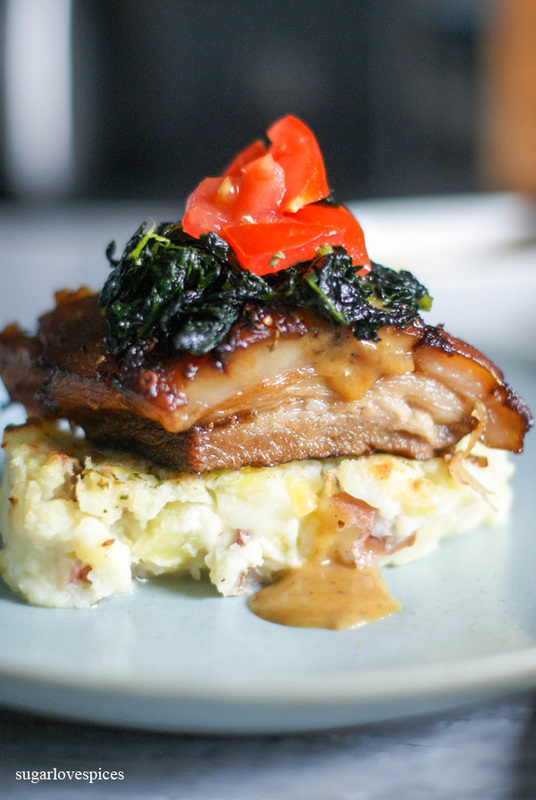 One particular cut of pork meat that has come to the forefront of masterful cuisine is the pork belly. The cut of meat is usually found in Europe, and East Asian countries, but is hugely popular in countries like China, Philippines, and Korea. Childhood memories I have that come close to pork belly where pigs feet and trippa (tripe: beef belly) which always made me shudder in disgust and my father would say you don’t recognize the good foods of course in Italian “non conosci la roba buona!” I would reply well I think I do but that looks like ______. Not a good answer, lol. But I think as time goes on and maturity sets in you are more daring to try new things and there have been many things I would not have eaten even if my life depended on it, that I now enjoy, things like squid, mussels, caviar, sashimi, and you can add pork belly to my list. The first time I ate this particular cut of meat was at Three Boars and I was fascinated by the texture, the moistness, that crispy skin, and the juiciness of the meat, along with being well prepared with spices and seasonings. 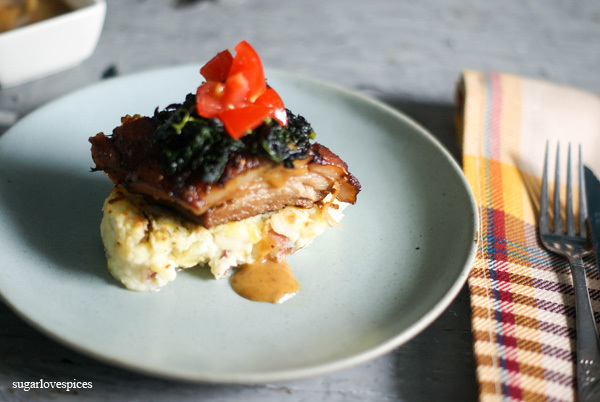 Some time has passed since having pork belly again, and thinking of what recipes I wanted to try this week and having not made a meat dish in a while, I wanted to make something beautiful, hearty, succulent, and tasty. In my mind I had a vision of a tall tower like placement with the pork beautifully placed on a dish of various textures. Off to the market for our usual weekly fair and also to look for a nice cut of pork belly. I found it at the Irvings Farm Fresh Market, a stand at the Old Strathcona Market specializing in pork products. I chose a nice modest piece of pork belly with beautiful layers of fat and grains of meat, a nice thickness of skin, just what the doctor ordered, not for the sake of after eating this I would have a heart attack, but for the reason that it was going to be soooo good that I would be happier than a pig in _______. Excitedly returning home, trunk loaded with all that good stuff, and ready to research recipes and ways to prepare pork belly to inspire me to create that vision I had. I looked at quite a few recipes and determined that this was going to take lot because pork belly demanded that slow cook preparation braising in a nice broth and veggies. I did see a video of Gordon Ramsey where he prepared a nice cut of pork and really liked what he did with it. I decided to make a dry rub of ingredients like salt, pepper, coriander, sage, bay leaf, paprika, Chinese five spice, dried oregano, rosemary and parsley and to add a bit of sweetness some brown sugar. Just like Gordon, I sauteed a nice mirepoix of carrots, celery, and onion, I call this the culinary holy trinity because it is the base of many sauces, soups and stews, and one I use quite frequently, and there is nothing like that smell that emanates from this trio when it is cooking, always stimulates my appetite. I washed, cleaned, and scored the skin side of the pork belly to allow all those spices to penetrate the skin, fat, and meat, and laid some bay leafs on top massaging all those flavors beautifully into this meat. Laid to rest and marinate overnight on that sautéed bed of mirepoix. Early morning has come and I awaken to the task of taking this dish to the second level, preparation for the oven. I heat up a nice big pan with some extra virgin olive oil and sesame oil, I sear both sides of the pork belly forming a nice golden caramelized crust, the aroma floating in the kitchen is wondrous, the spices, the sweetness of the brown sugar, that combination of olive oil and sesame oil, a toss of a couple of cloves of garlic but taking care not to burn it, and this baby is ready for the oven. I bath the pork belly in some vegetable stock filling the pan till it is just below the top of the belly. Into the oven it goes for almost eight hours, cooking slow and low, beautiful, I am salivating as I write. 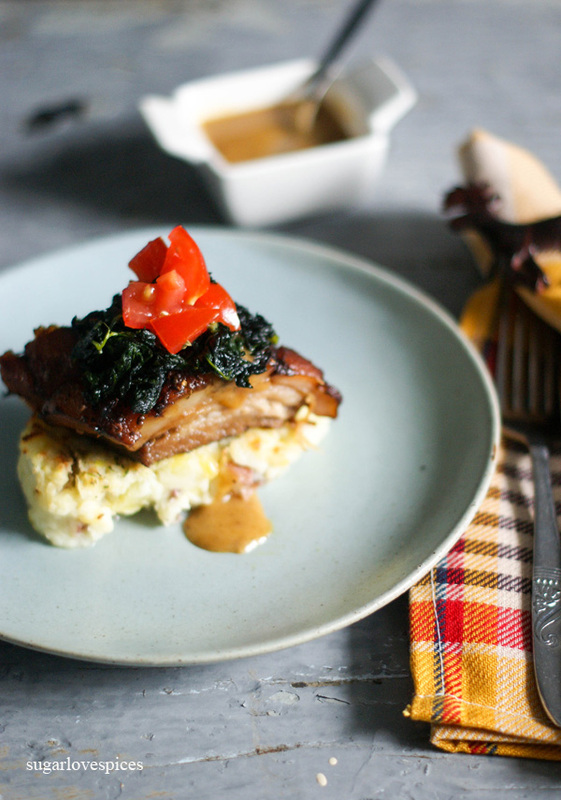 To accompany this pork belly, I thought of some rustic mashed potatoes skin on and a nice sauteed kale, and some marinated vine tomatoes with oregano, salt, pepper, and extra virgin olive oil. The potatoes flavorful with sour cream, roasted sweet garlic, chives, and that skin which adds so much flavor, and leaving the mash somewhat lumpy so you have both smooth and textured experiences. The earthiness of the kale mixed with the olive oil tremendous and for just a bit of acidity to the dish those tomatoes. The sauce is that liquid with all those juices slowly simmered for 8 hours, take about intensity. One thing I found interesting was Gordon Ramsey’s use of a starchy slice of bread to gather up all the fat and oils from the top of the broth. It works amazingly. Out with the bay leaf and anything that would not compliment this anjou. Puréed with a cuisinart and a couple dabs will do you as you don’t want to loose any of the other flavors. 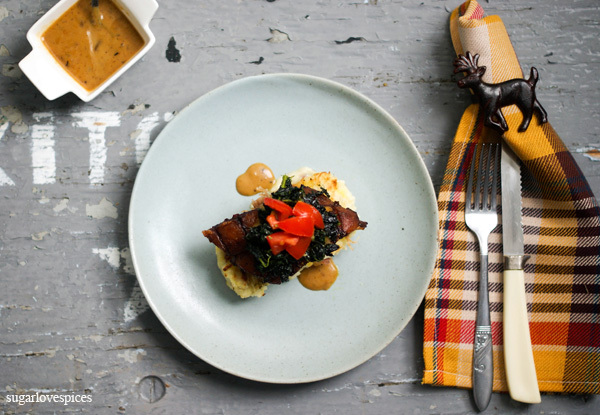 The pork belly so crisp on the skin, the fat like butter melting in your mouth, meat juicy, pull apart tender with so much flavor that will have your taste buds singing. The potatoes light fluffy and somewhat pungent from the sour cream and sweet from the roasted garlic with morsels of larger pieces of potato and those chives, indescribable. The kale moist and tomatoes that add just that right amount of freshness. This dish will be memorable, and I have to say it was a pleasure to make also. Sometimes that saying of good things come to those who wait is true. Today’s song, a nice slow epic ballad: “Lights” by Journey. 2–3 tablespoons milk depending on consistency. Wash and clean pork belly skin side.With a knife score the skin side in diagonals forming a diamond pattern on the skin into the fat. Drizzle a bit of olive oil on both sides and massage in. Mix salt, pepper, coriander, oregano, rosemary, paprika, brown sugar, Chinese five spice, parsley. 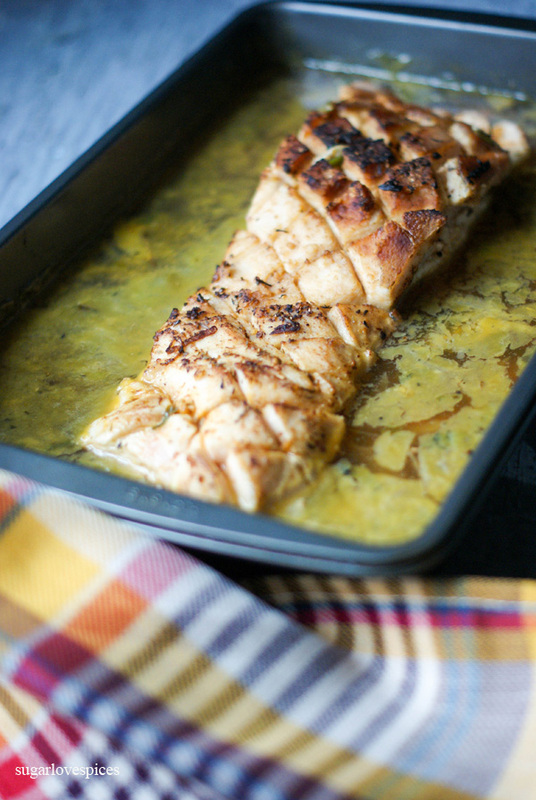 Rub dry ingredients into all sides of the pork belly. In a pan saute carrots, onions and celery, till onions are translucent, and add sage. Place mirepoix in a rectangular deep roasting pan. Place pork belly skin side up on top of mirepoix. Marinate in fridge over night. Take out of fridge, and heat up olive oil and sesame oil in a pan. Place pork belly skin side down and sear till crispy and browned. Repeat this process with all sides of the meat. Then take pork belly out of pan and place on top of mirepoix in the same pan as it was marinating in. Take 3 cups vegetable stock and pour into pan bringing the fluid to just below the top of the meat. Heat up oven to 350°F and place pork belly into the oven, middle rack uncovered. Pork belly will cook for approximately 8 hours but around the 6 hour mark turn oven down to 250°F, and at close to the end down to 200°F. Wash and clean potatoes and cut into nice chunks leaving skin on. Place into a pot covering the potatoes with water. Bring to a boil and cook for approximately 20 minutes but check to make sure they are fork tender. Place 4 cloves of garlic with husk on a piece of foil, drizzle with olive oil and place in oven to cook for about 15-20 minutes or until garlic is soft.Then take out of oven and mash. Drain potatoes, mash roughly, add garlic butter, sour cream, chives, salt and pepper to taste, then add milk as needed for the desired consistency. The potatoes do about 1/2 hour before pork belly is done. Wash kale and place into boiling water and cook for about 10-15 minutes or until tender, drain and heat up olive oil in pan and add garlic, salt and pepper. Saute for about 10 minutes and set aside. Drizzle olive oil and sprinkle in oregano, salt, pepper, set aside. 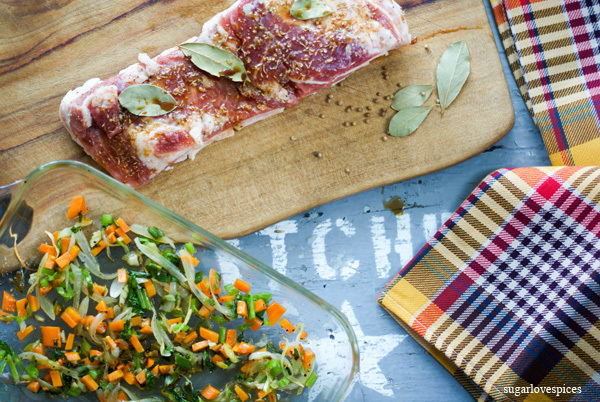 Take pork belly out of oven and place on a cutting board to rest. Take out bay leaves and pieces of fat, and with a couple of slices of starchy bread skim the top of the pan juices to take away any of the surface oil and grease. With a Cuisinart blend juices till nice and smooth. Cut Pork belly into nice rectangular pieces. On a plate spoon a couple of spoonfuls of the potatoes. Place the pork belly on top nicely. Spoon some sauce mix on top. Add kale on top of meat and a nice spoonful of diced tomatoes. Remember in your prep time that there is the marinating time over night. The cooking temperatures will vary depending on your stove type whether just normal or convection. That looks incredible! I only recently tasted pork belly for the first time and I loved it. Have not yet tried making it myself but when I do this will be the recipe I try. Thanks! Hi Nadia thank you for your lovely comment, it was my first time making this cut of meat and I have to say because of the long cooking time it becomes so tender its indescribable, and the fact that the top stays nice and crispy adds such variation to the texture. The sauce well all those juices cooked for hours reducing and intensifying OMG! Would love to hear how you make out. Take care and happy braising.